The number one question in your mind, particularly if you are new to working with management consultants like us, is probably this. Will I get real value for the fees I am paying? I am happy to personally assure you that at Logistics Bureau, you will! On most of our consulting assignments you can expect a payback within less that 6 months. That is why we have loyal customers many of whom have been with us since the day we started the business in July 1997. Feel free to contact me directly (Rob O’Byrne) on +61 417 417 307 or Email. We understand the process involved in getting approval for consulting assignments. Hey, we use consultants a lot ourselves! That’s why we take our time in jointly scoping and planning all client assignments (at our own cost) before we even finalise a proposal. So rather than just say No, call us to discuss your concerns. Once we know what they are, we can easily adapt our approach to better meet your specific needs. Because we’d hate you to miss out on the benefits that our assignments can deliver to you and your organisation. After all ‘helping people and organisations’, is what we love to do. Is your work just based on leveraging bright young consultants and fancy software tools? Certainly not. 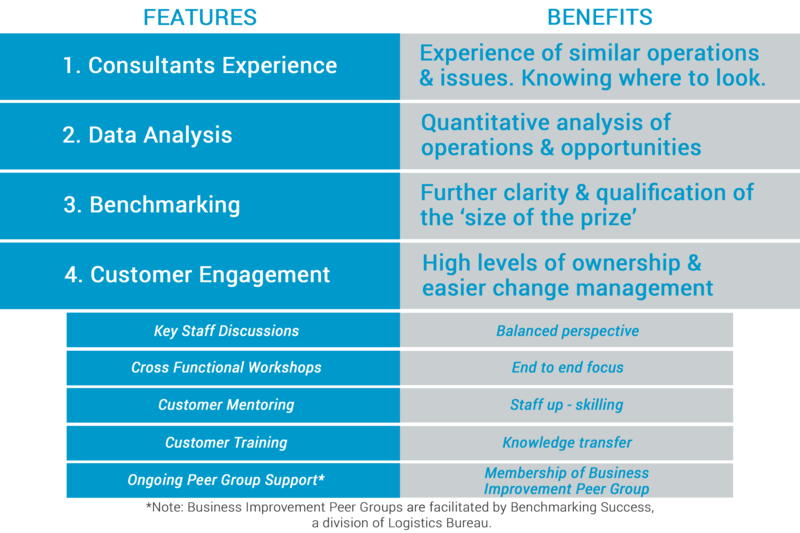 Whilst we have many bright young consultants (and some not so young) as well as some specialist software tools and methodologies we apply an approach that leverages four key areas as illustrated here. Consultants experience. Our project managers and directors in particular have considerable business, supply chain and logistics experience. Whilst we do not wish to apply template or ‘boiler plate’ solutions to our customers problems, this experience can prove invaluable in knowing where to look for issue causes, as well as understanding the broad range of solutions that might be viable. Customer Engagement. It is vital that key stakeholders have the opportunity to provide input and feedback to the project, so that they can provide direction and guidance based on their own experience and business goals. Without wishing to impose on the time of our customer’s management team, it is essential that key managers ‘engage’ with the project team at critical points. Recognising their time constraints, we ensure that this is well focused, productive and kept to a minimum. Benchmarking & Modeling. With access to extensive industry benchmarks via our subsidiary Benchmarking Success we are able to easily quantify business performance and opportunities. This supports our specific option and scenario modeling that will then identify the means to realise the potential benefits. an example of these modeling approaches can be seen at Distribution Network Design. These can be on a fixed fee basis, or on an agreed daily rate basis. Some of our existing customers prefer the daily rate, particularly for projects such as implementation support, when they want flexibility in the amount of days provided by our consultants. But the majority of our work is based on an agreed fixed fee, for an agreed scope of work and outcome. How do you establish the level of fees? Our fees are based purely on the resources required to undertake the work, and to deliver the agreed outcomes. Careful project scoping and planning is carried out with our customers prior to submitting a proposal. In this way, we can ensure that both parties expectations are clear. Detailed project planning then takes place to establish time lines and resource requirements. All of this is carried out at our own cost. We prefer to progress through 2 or 3 iterations of a proposal if necessary, to ensure we get it right. We take great care in our project planning and pricing, because we guarantee the results! Do I need to prepare a briefing document? This is helpful but not essential. Our consultants are experienced at establishing your needs, and the best approach is generally for you to broadly explain your business to us and then to discuss your particular issues. Based on these initial discussions, we will be able to outline your potential options, which may or may not involve assistance from Logistics Bureau. It can also be useful at this stage to highlight (within the bounds of client confidentiality) how we have resolved other companies similar issues. A short history / background on the company / organisation. An overview on the products and services provided. An overview of your customer types and expectations. What issues you have already identified. What you would like as an outcome from our involvement. How long does it take to prepare a detailed proposal with costs? Dependant on the specific needs of your business, projects can be scoped, planned and costed within 24-48 hours if required. Although we prefer when we can, to take a more collaborative approach and work through a couple of drafts with our customers, before agreeing on the final proposal. Confidentiality. I am concerned that you might already work for our competitors. We take client confidentiality VERY Seriously. For this reason we openly list all of our customers on this website. This gives potential customers a chance to see who we have worked for in the past and prepare any questions regarding confidentiality before approaching us. We do indeed work for many companies that are in competition. Our understanding of specific industry sectors is one of our major strengths. Rest assured however, that strict confidentiality and data security measures are employed, and where necessary, consultants are not allowed to work with competing client companies. Furthermore, we openly declare to our potential customers, who else we are working for in their sector, whilst at the same time, seeking existing customer’s approval before commencing work with one of their competitors. Consultants. What type of consultants are employed by Logistics Bureau? I don't want a bus load of recent MBA graduates descending on my business that have no real business experience. I have not heard of Logistics Bureau before. How do you source new business? Our marketing effort is very low key. The reason being, that 65% of our business is repeat business with existing customers. A further 30% of new business is sourced via referrals from existing customers. The remainder is in bound enquiries. I have never hired consultants before. I intend to get 3 competitive quotes, but how do I know I am picking the right ones? Meet them all briefly first, to see if there is a good cultural fit. Then take out references for the type of work that you require to be carried out. Make sure you follow up the references, not just for the consulting firm, but the specific consultants that will be working with you. Then issue a brief and have the consultants present their proposals to you. Insist that the actual staff carrying out the work, will be present. It may even help, particularly for large projects, to assemble an in house team to evaluate the proposals, based on an agreed set of criteria. Do not be surprised, if the fees quoted vary considerably. This can occur due to different interpretations of your brief, amongst other things. Your challenge is to see beyond the fee structure and assess the capability of the firm to deliver the required outcomes. We tend not to get involved in ‘multiple quote’ scenarios that often, as most of our new clients have already done their homework, talked to some of our existing clients and decided that Logistics Bureau is a good match for their needs. But we appreciate that sometimes the organisation will insist on sourcing multiple quotes. For a project and organisation that we think is a good fit with Logistics Bureau, we are always happy to participate. Payback. Do any of your customers measure your performance against your fees? Yes, many of our customers do and we welcome that. In general, we would expect our customers to recoup our fees in under 6 months on any given project. The best I have ever seen, was actually a very large project, that had a 7 day payback!